Ruffwear’s Omnijore™ Joring System is the perfect complete joring-set for every dog that likes to accompany his owner on outdoor activities. With the help of this pulling harness, the dog can pull people on skis, skates or mountain boards. You are well-advised to use this set also for Canicross and Dogtrekking. The Omnijore™ Joring System consists of one harness, one waist belt and one elastic joring line with shockabsorber. The harness is padded in order to assure comfortable wearing. A 4-Point-System of adjustable buckles and snap locks enables perfect fitting to the body of the dog. The waist belt is connected to leg loops, which prevent the harness from slipping off. Three at the strap attached pouches offer enough space for the owner’s provisions as well as for dog treats. The elastic tow line contains a rubber core to enable counteracting sudden jerky movements and thus to protect the joints of dog and owner. A carbine made of anodized aluminium is constructed in a way that the leash can be fitted single-handedly. In addition, the leash is furnished with two hand loops for more safety during the tour. Omnijore™ Joring System comes in three different sizes: S for dogs with chest girth of 56-69 cm, M for girth of 69-81 cm and L/XL fits dogs with chest circumference of 81-107 cm. Since I'm absolutely not familiar with pulling harnesses, I thought I'd start by buying this one. Great thing, with both on the leash now works great. Also very nice with one on the bike. Very good workmanship of the hip belt, the leash and also the harness. Great for my two Labradors. The only drawback: The two lateral strap adjustments on the harnesses unfortunately come loose after a certain time, when the dogs move more sideways, so not only pulling straight ahead in front of you. The set is of very high quality. Absolutely great!!!! It is fun for everyone (from 14-42 years) to run with the dog or to ride the dogscooter. Our dog liked the Ruffwear dog pulling harness from the first minute on, it does not "slip" and it does not rub. Very good are the adjustable possibilities for dog and owner. The package corresponds exactly to the description, upholstery etc. everything great. Wish everyone a lot of fun with it. First of all I have to praise this advice from the chat. Was really very very helpful. The belt for the owner is very comfortable and thickly padded. The leash can move quite freely because it is mounted on a strap. The bags are very helpful. I think the harness for the dog is also very comfortable. Our dog is happy when we put it on. In any case, it does not rub or slip. In other words, a great fit. The only thing that isn't so great is that you can't open the straps completely. So you have to put the legs through what maybe not every dog likes. The leash is very good and high quality workmanship, I like the carabiner very much and it is very stable. The harness for my girl was expensive, but fits great and is very good quality. Beautiful functional dog harness, the waist belt has wonderful stowage possibilities and the emergency release of the leash is great. Unfortunately you can't open all buckles, and the dog has to pass through 2 straps at the same time and then you have to "squeeze in" his paws. Especially for a sensitive dog not optimal. 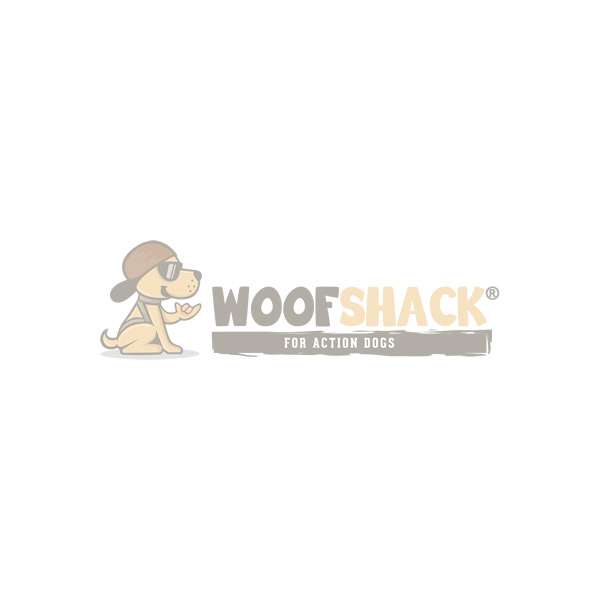 Great service here at Woofshack! In addition, very fast delivery to Germany. Thank you. Have a medium sized male with extreme hunting and pulling urge...The system is absolutely awesome, what I have tested so far( jogging and scooter) The dog feels the resistance, but can fully let off steam and my joints are spared. About the size: I wasn't sure about the size, but after a short consultation with a Woofshack employee I ordered the right size. Incidentally, great customer service, mail with question sent, no 2-hours later call back with great advice (they really try hard). The set certainly has its price, but in terms of quality it is absolutely ok. I think the " release rope " is very practical in case the dog is unstoppable.